We reached a sign at the outer boundary of the center of Tsumago that indicated riding was not allowed further in the town. 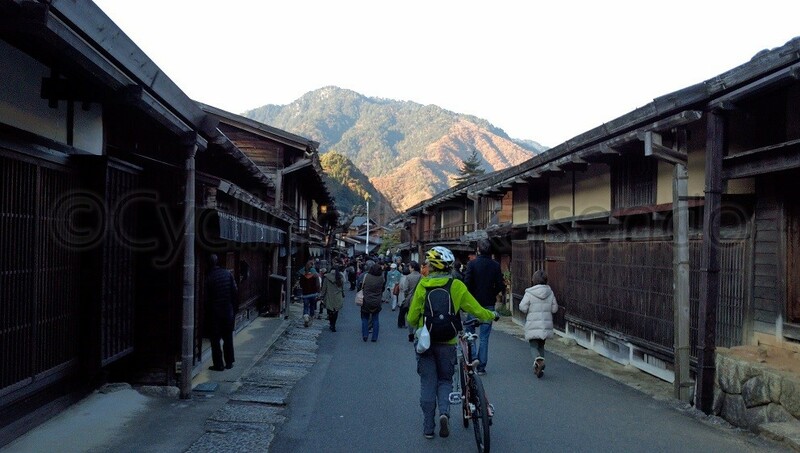 We got off our bikes to comply with the sign and headed into the center of Tsumago. Eventually we reached rows of buildings on both sides of the street that were filled with people. The density of tourists was surprisingly higher than I expected. The crowd was like you find in a shopping street in Tokyo. During the Edo era this area was known to be an economic hub however it seemed insanely busy and I found myself wondering if it was the busiest day the street had seen since the town was established. 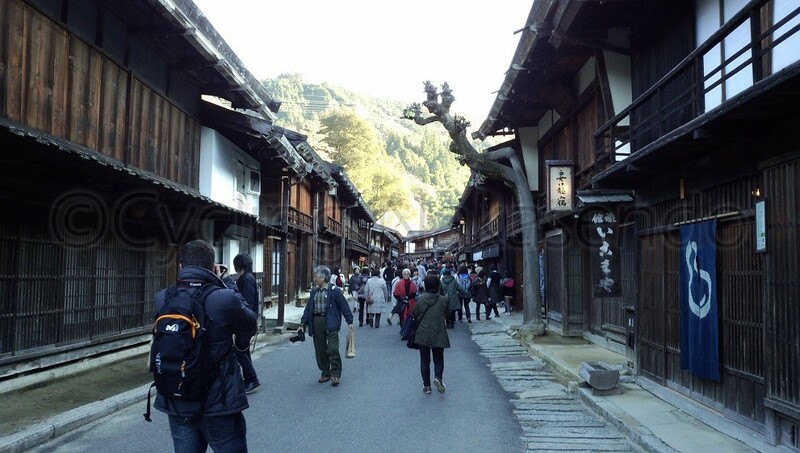 Now it is a shopping street selling local crafts, tea, sweets and souvenirs for tourists in historical buildings. It is truly an achievement to restore and preserve an entire post town to this level. The result of this is that Tsumago and Otsumago have collectively become Japan’s first Nationally-designated Architectural Preservation Site. 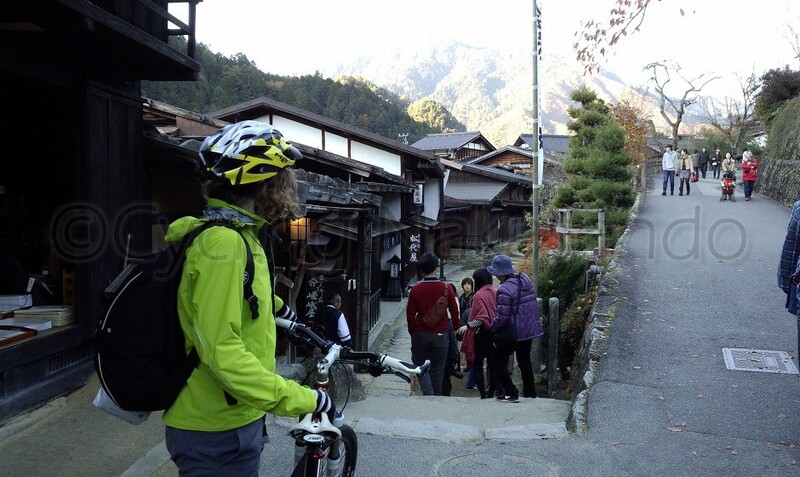 The route resumes with stairs from the foot of the Kotokuji Temple and continues through the Terashita (under the temple) district. The route from the foot of Kotokuji Temple is in the form of a masugata that incorporates stairs. 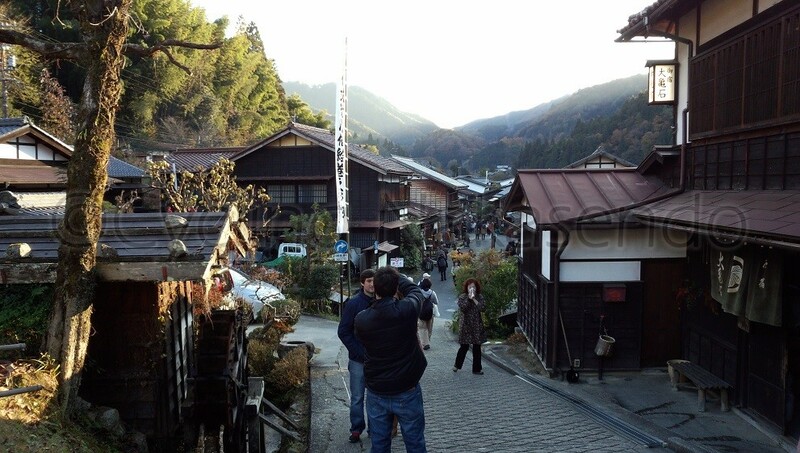 An additional road for cars has been built to avoid this staired masugata which cuts into and follows the side of the hill leading to the front of Tsumago tourist information office. This building was originally built as a police station in 1897, about 30 years after the Edo period, and was used as a town office later, so it looks relatively modern in style compared to the other buildings along the street. Given that the restored honjin and waki-honjin come up soon after this building we can understand that this is technically the center of Tsumago. Waki-honjin functioned as extra accommodation for high-ranking officials or those who had a higher status than the general populace but were not as high-ranking as those who could stay in the honjin. The present waki-honjin building was built 10 years after the feudal era (1877). It is significant because its entire structure is built from Hinoki cypress. At the time, the local Owari feudal domain strictly prohibited logging of 5 species of trees in the Kiso region. This was in order to regenerate the forest from serious deforestation caused by high demand for timber at the beginning of the Edo period. The protected species were Hinoki cypress, Asunaro (hiba arborvitae), Kouyamaki (umbrella pine), Nezuko (Japanese arborvitae) and Sawara cypress. As a group they were commonly referred to as Kiso-goboku. Those who violated this rule (such as those who cut down or even lopped off a twig from those trees) received the maximum penalty and were generally beheaded. In addition, the Owari feudal government set up special stations solely to inspect wood being transported on the trade route in order to ensure strict adherence to this rule. The legacy of this policy can still be enjoyed today as forests within the surrounding mountains continue to be rich in the trees of Kiso-goboku. The latter part of the street curves slightly. 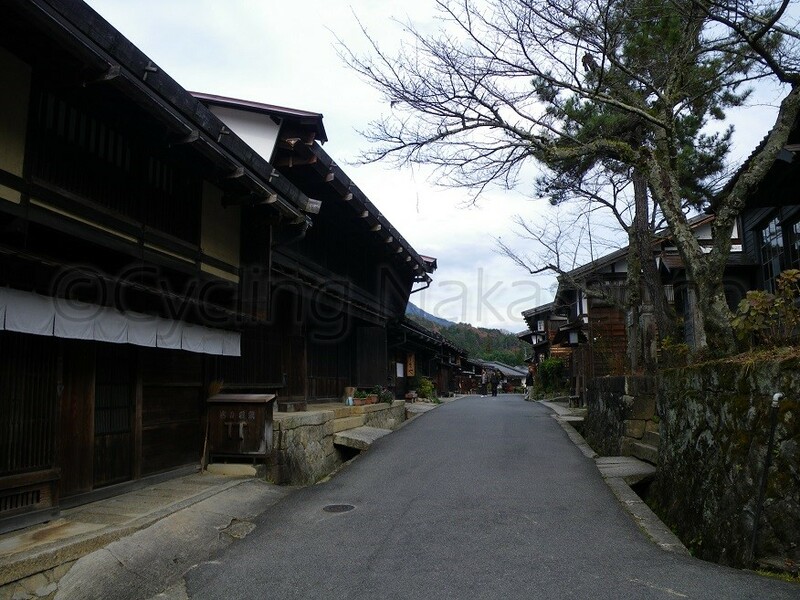 The buildings that line the street are contrasted against a wooden and white shikkui wall until it reaches a restored kousatsuba and watermill positioned halfway up and to one side of a concreted slope. The street got much quieter at the top of the slope as most of tourists had turned back in the direction of the honjin. We saw the inn, Daikichi, which we had planned to stay in at first but were unable to book a room at, located at the edge of the town. I had hoped to stay overnight there to see the very quiet Tsumago at night, which is gently lit by Japanese paper lanterns that are sure to induce an indelible scene of the past. Knowing we would probably not be able to make up for earlier delays in the day’s schedule I felt more than ever it would have been best to stay here if we could have.